When it comes to sharing woodworking with my grandkids, I keep it simple. In fact, I really don’t care if they take a shine to woodworking, I would just rather they get the opportunity to be creative. At this point, I have done very few structured projects, I usually just let the kids have at it with the bin of wood scraps. Kids don’t need to be told what to build with the scraps, their imaginations kick into high gear and they figure it out naturally. I call this the “empty box effect.” An empty box is an open ended toy and a child’s imagination starts exploring all of the possibilities of what the box can become. The same thing happens with the wood scraps. 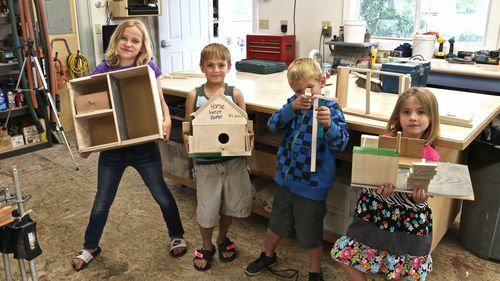 During the kids’ build sessions, there is plenty of opportunity to teach them about safety, how to use the tools, and problem solving skills. I think that both structured and unstructured projects have their own advantages and lessons to offer, so I do not necessarily value one over the other. But I will admit that structured projects require more prep time because you have to make parts in advance. When working in the shop, the kids are exposed to a limited set of dangers, but that is an inherent risk of having them in the shop. Overall, the exposure is controlled and gauged according to the abilities of each child. 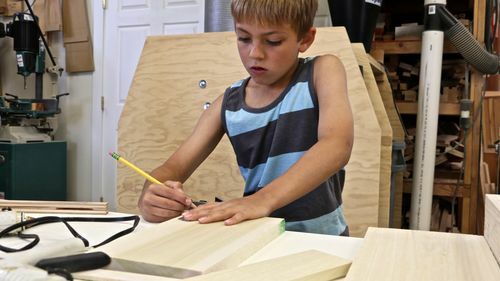 The fear of allowing kids into the shop will never give them the opportunity to learn self-control and respect for the tools and a somewhat hazardous environment. Personally, I don’t see that it is any less hazardous letting kids ride a bike, a skateboard, or jump on a trampoline. I will not allow an unreasonable fear to keep my grandkids from such a valuable learning experience as they have in my shop. In the end, I am trying to develop a culture of activity, creativity, and exploration in my family. I think all of the benefits of this far outweigh the perceived dangers. And to think, I have not even mentioned the added benefit of the hours that the kids have spent with me, Grandpa Todd. There is enough content and lessons there for another blog. I hope you enjoy the video about woodworking for kids. Great approach Todd, and they are obviously enjoying their time there with “Grandpa”. What a COOL Video with the kids playing in your shop! You might get a few more ideas from this FUN section of my website... enjoy! As a little boy of about six or seven my grandpa would let me explore my imagine in his garage with scrap wood. I had only a few tools, mainly a coping saw, a drywall rasp, a hammer and a nail punch. But I made them work. It inspired in me a love for woodworking that still exists 35 years later. Your grandkids will remember these days for the rest of their lives. Joe L – thanks for sharing such a great resource of those kids plans! Liquidbrain – I hope the kids look back on this time fondly. ScottKaye – I can’t believe we have grandkids! “Grandpa Todd” seems like such an odd fit for me. Great video Todd…keep up the good work with the grandbabies…we need more woodworkers! Love it!! Love the philosophy on kids in the shop! Very nice story. Thats it I am quiting woodworking they are making better things than me! Love the vyce and drill work!! I will send a link to my boys so their kids can see it too! Nice philosophy and great pictures of the kids ! Well done Todd great time together with the grandkids . to help you in the shop. That is awesome, and you are a really great grandpaw all the way around. Good thinking to let them do the thinking and creating.